A Man With A Bucket On His Head Ran To Unseat Theresa May. Why? Well ... : The Two-Way Tough to say, really. But Lord Buckethead was clear on his platform: Nationalize Adele and buy his lasers. Still, he got fewer votes in the U.K. election than a man in a fish stick costume. 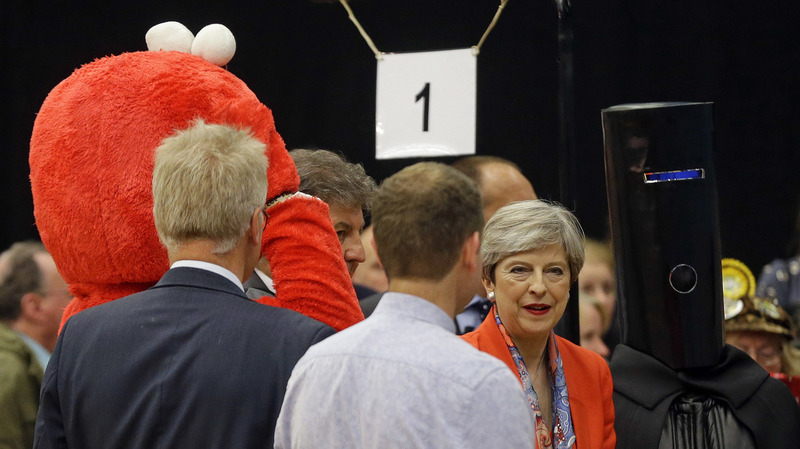 British Prime Minister Theresa May stands between Lord Buckethead (right) and Elmo, because — well, because sometimes democracy is weird. You might be wondering about the guy wearing a bucket on his head. That's OK. When broadcast news outlets panned across the row of candidates standing beside British Prime Minister Theresa May on election night in the U.K. — revealing several respectable-looking gentlemen, then a cape-draped figure without a face — a number of people had questions, just like you. His name is Lord Buckethead. He ran to unseat May as representative of the Maidenhead constituency. And he got 249 votes. "Stop selling arms to Saudi Arabia. Start buying lasers from Lord Buckethead." He has a music video too, naturally. Lord Buckethead's appearance was part of something of a political tradition in the U.K., where it's not uncommon for all of the candidates for a particular parliamentary constituency — no matter how, well, eccentric — to stand side by side as the vote is decided. That's why, if you scanned just a little farther along the line, you might have noticed a person dressed in a giant Elmo costume. It's also why, elsewhere in the country, a candidate called Mr. Fishfinger — who according to The Guardian, "changed his name by deed poll to take part in the election" — stood behind the night's local winner, Tim Farron. Fishfinger got 309 votes, by the way. Perhaps Lord Buckethead said it best when he sang, euphonious voice muffled by his noble bucket: "You never knew that space lords would do that."